Moore’s Law predicts that the number of transistors we can pack into an integrated circuit will double every two years. This has held true since integrated circuits first appeared in 1958 and is expected to continue until around 2020 when physics will prohibit making conventional circuits any smaller. But the party won’t end there. Ray Kurzweil explains that integrated circuits are not the first “information technology” to follow this consistent doubling of capability. Instead they are the fifth such paradigm. Earlier paradigms included mechanical relays and vacuum tubes. Each paradigm reigns supreme for a while, but when a physical limit is reached the paradigm steps aside and a newer more advanced technology carries the ball. So if exponential growth continues past 2020 where does it take us? For all these graphs I show a doubling every single year, not every two years as Moore’s Law predicts. Kurwzeil says if you consider price as well as performance doubling every year is more accurate. And as we'll see, the exact numbers do not matter as much as you might think. This shows performance relative to today. 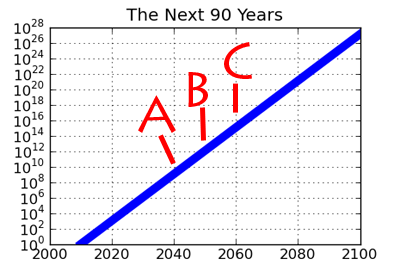 So this graph predicts we will see a 109 (one billion) fold improvement by the year 2040. Something funny is going on. 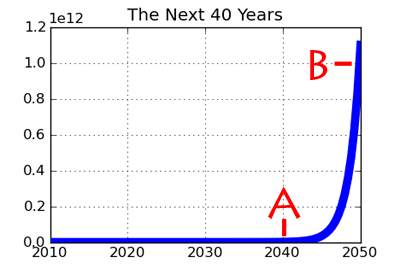 The manic peak around 2040 is basically flat in this new graph. The huge increases in the final 5 years dwarf all progress from previous years. Now 2050 looks like the place to be. Again the same pattern. The whole first half of the century through 2050 now looks an absolute bore. But around 2055 things start rocking. Basically nothing going on until around 2095 when things take off. It’s very much like finding your keys in the last place you look. Wherever you choose to stop drawing the curve, that looks like the exciting peak. This is the nature of exponential curves. The "big event" is always right at the end of your graph. Now all the excitement has been replaced with a boring line. But wait. Which is more representative of how we perceive progress? Is it building to an exciting peak? Or just chugging along incrementally? We in fact are making steady progress and not building to anything in particular. Think about your own experience. A computer twice as fast is always just a barely noticeable improvement. This will hold in 2050 the same as it does today. 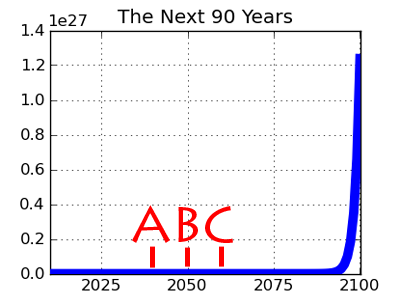 Doubling a 2050 computer is adding a mind-blogging amount of power, but it will only count as one small tick of progress. So the log plot is the right one. 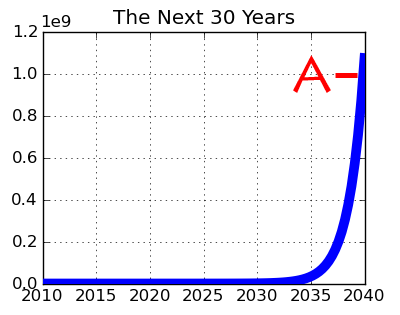 Raw computing capacity is increasing exponentially, but computational utility, what computers can do for us, is increasing only linearly. There is no peak at 2040 or any other year. 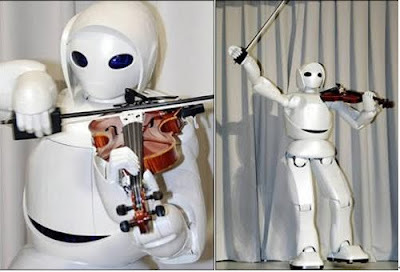 So what does this say about The Singularity? The Singularity is not about graphs. It's about reaching a threshold where machine intelligence is common place. Where machines create new generations of machines ad infinitum. Nothing about these graphs suggests The Singularity won't happen. If we reach the threshold where we can build machines more intelligent than ourselves that will be a strange and exciting day to be sure. What these graphs remind us is that no magic upward surge in technology is coming in 2040 or any other year. It's steady consistent progress, one hard earned doubling at a time. What is the ultimate physical limit of computation? Bremermann’s limit describes how much computation is possible in matter, for example if you could use every molecule in water towards your computation. There are a lot of molecules in matter so the limit is very high. You could also try making the computer very big. Wikipedia says a computer the size of the earth could perform 1075 operations per second. Today a supercomputer can do 1015 operations per second. Our 2100 prediction is computers would be 1027 times faster than today, so the 2100 era supercomputer would run 1042 operations per second. This is amazingly fast, but it's nowhere near 1075, so we won't be near the absolute physical limit even in 2100. Ray Kurzweil's tour de force. He is the primary target of this post, yet much of most of what he says is still completely true. Certainly it's required reading for anyone interested in the topic. >A computer twice as fast is always just a barely noticeable improvement. The last few days of exponential lilypad growth before the lake is completely covered will seem very abrupt and explosive - to the lake. 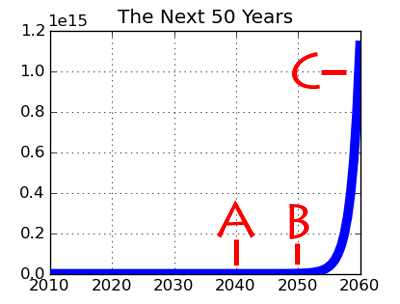 Likewise, the last few doublings of computer speed that equal/surpass human intelligence will likely seem very discontinuous - to humans. But yes, from an objective perspective, it's a smooth process throughout. Regarding the previous comment, at the risk of being a little too Zen, there is no lake.